Oh David Soper, the almost permanent winner of the Slayer Sword. It's not surprising to see another amazing mini from him, and from the forces of Nurgle again. His take on Gutrot Spume was amazing, and this Death Guard is right up there with it. While the model itself lacks any conversions like Gutrot had, the quality of the paint job is pretty stellar. 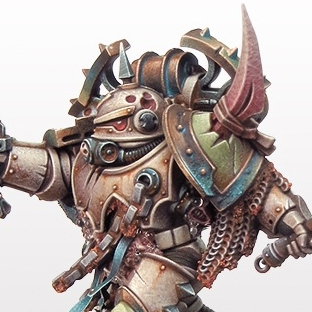 He's effectively managed to convey the dirt and grime of the Plague Marines while still keeping it bright and sharp. Every surface on here has some sort of texture painted onto it, and some even have physical textures added, like the rust on the chains. It's subtle enough though that it doesn't overpower the detail on the model. In some of the close ups you can really see the dotted texture that is a trademark of his painting style. It looks great and I really love how warm this model is. 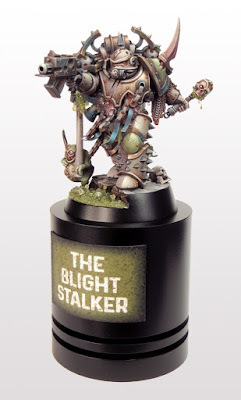 The skin on the Nurgling and the blight grenade really stand out to me too. 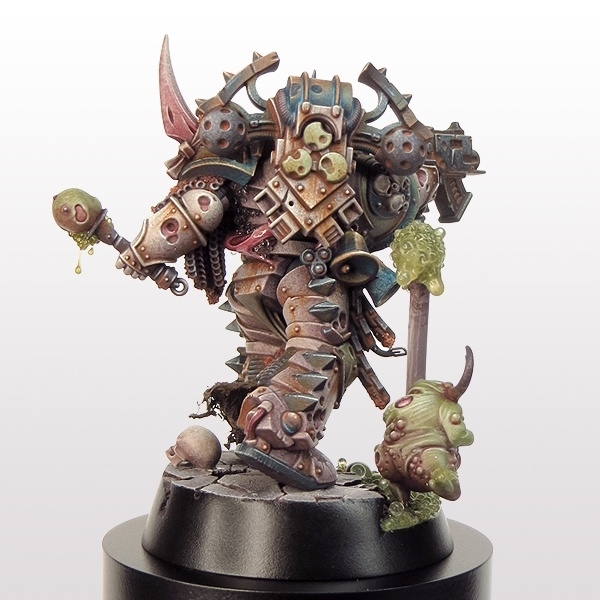 It's a classic Nurgle look, but he does it so well. Also making a return from some of his past models is the use of microbeads to represent droplets of liquid. The slime on the Nurgling's stick and on the base look absolutely sickening, in a good way. I can really imagine it fizzing and popping with whatever toxins Nurgle has brewed for it. It looks to me like he carved off the sculpted goo from the Nurgling's stick and did it all with microbeads and whatever else makes up the slime. I love it and it's a great touch. The base itself is simple enough but a perfect fit for a Nurgle model and does a great job at framing the model. It's no wonder this took home the Slayer's Sword at the 40k Open Day.